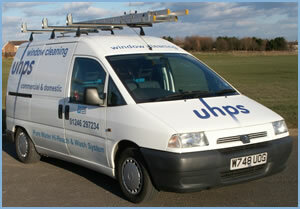 uhps is a commercial and domestic window cleaning company based in Chesterfield. We offer a first class professional service of quality, reliability and trustworthiness to meet your requirements. We are registered by Derbyshire County Council as a preferred window cleaner for schools in the area. We specialise in the Pure Water Hi-Reach and Wash System and bring proven industrial cleaning technology to the local community. We believe that 100% pure water cleans windows better as the water actually attracts dirt off the surface being cleaned. Windows cleaned with pure water should stay cleaner longer as there are no sticky residual soaps left on the surface for dirt to attach to. Windows should even stay cleaner after rain because there is no soap residue for the rainwater to reactivate. 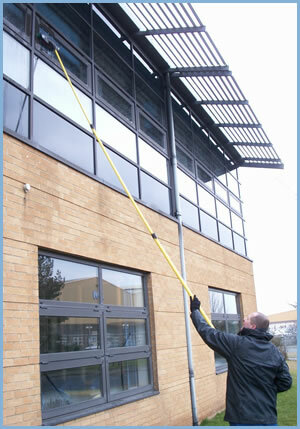 The telescopic pole system safely reaches 99% of windows easily from ground level and eliminates the need for ladders. This system is preferred by the Health & Safety Executive Working at Height Regulations which ensures maximum safety for both customers and uhps. We are fully insured for vehicle and public liability. The uhps vehicle is clean, well equipped and easily identifiable. uhps staff are fully trained, polite, smart and wear easily identifiable uhps logo workwear.